At the Ultra Trail du Mont Blanc last year, I saw runners with laminated elevation profiles hanging outside their packs for easy access. Same as mine, but much slicker. And it gets hipper – elevation profile temporary tattoos – http://www.elevationtat.com. What I know about slick and hip is mostly secondhand; but do those really count? For MUT running, distance and climbing are what really count, and I’m going to tell you how to count ‘em up. My story starts last summer in Chamonix – a magical place that greets up close with peaks, glaciers, and clouds; like everyone, I got off the airport van and gawked, grinned, snapped pictures, and forgot my jet lag. Enchanté. Next there’s the engineering marvels centered around moving through the mountains: hang gliders, trams, and trail signs. The Swiss style trail signs list destinations along with hiking times; no mention of distance. The Swiss have developed an empirical formula combining distance and climbing to calculate hiking time – the details are in this article: http://www.zeit.de/2012/30/Wanderweg-Zeitberechnung (in German, try Google translate). The Swiss formula is a 15 degree polynomial, too complex for my ultra kit, and it doesn’t apply to running. But for hikers, it does the job, and answers the eight year old in all of us: are we there yet? The Swiss formula may be new, but the idea isn’t. In 1892 Scottish mountaineer Michael Naismith published a simple rule for estimating hiking time based on distance traveled and elevation climbed: 1 hour for 5 kilometers hiked, plus an additional hour for each 600 meters (2000’) climbed. A useful tool is not easily laid to rest, and today Naismith’s rule still echos across thousands of hiking websites. One form of Naismith’s rule is a ratio, and for MUT running, a good ratio is 1:10 – climbing 1000 meters takes the same time as running 10,000 flat meters. For example, say I can run a flat half marathon (21 km) in 1:45. That’s a pace of 12km/hr. If I want to run a half marathon with 1000 meters of climbing, I can expect it would take as long as a 21+10 = 31 km flat run, 2:35 at a 12km/hr flat run pace. For Americans, Nasimith’s ratio rule means roughly 500’ of climbing adds almost as much time as about a mile of running. Now that’s simple, and it fits in my kit – along with my baggie of elevation profile. Together, I can predict how much time to the next aid station. For example, at the Ultra Trail du Mont Blanc (UTMB), I met my crew briefly at the Arnuva, Italy aid station, and bid ciao 3:30 pm on Saturday. And I wondered: can I make it to the La Fouly, Switzerland aid station before dark? It’s only 8.7 miles, but almost 3,000’ climbing, including the Grand Col Ferret – the high point of the course. Naismith says that’s equivalent to 14.3 miles. My equivalent flat pace for the last 4+ hours, between Courmayeur and Arnuva, has been 4 mph, so it should take 3.5 hours; and in fact, I arrive in La Fouly just before 7pm, well before dark. That seemed to work. Was it just luck? And if not, is there more? To answer both questions, let’s zoom out and look at entire races, not just time between aid stations. When Ultrarunning Magazine assembles their lists of top graded performances, they use the Gary Wang’s statistical database of ultrarunning results to compare timings of runners completing multiple events in the same year – you can make the same comparisons online at Wang’s website: http://www.realendurance.com. To answer the first question, let’s compare Wang and Naismith for the biggest 100 mile runs in the US. To answer the second question consider: there are races in Wang’s database which don’t yet have runners with same-year finishes, like the Bryce 100 & Rocky Raccoon, or races outside the US. If Wang can’t tell us (yet) the relative difficulty of the Bryce 100, then let’s ask Naismith. Start with a baseline: the Rocky Raccoon 100. RR has just over a mile of climbing (5,375’) and an equal amount of descent. By our MUT Naismith’s rule, RR is equivalent to 110 flat miles. Compare Run Rabbit Run, with just over 20,000’ feet of climbing , and an equal amount of descent, equivalent to about 138 flat miles. So the ratio of Raccoon/Rabbit is 110/138 = 0.8. To predict my Raccoon time, I multiply my Rabbit time by 0.8; or I divide my Raccoon time by 0.8 to predict my Rabbit time. Gary Wang’s Realendurance.com shows a same-runner same-year ratio of 0.75 – a reasonable agreement. 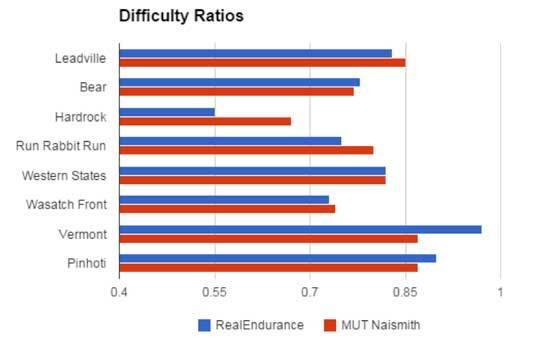 The graph below compares Wang’s Comparative Difficulty Ratios with the MUT Naismith ratios for the biggest 100 mile ultras in the US, all compared to Rocky Raccoon. Except for Hardrock and Vermont, the agreement is very good. The disagreement on Hardrock makes sense; Hardrock is more than climbing – it’s altitude, terrain, weather, and (for most runners) two nights. The disagreement on Vermont is harder to explain – 0.87 for MUT Naismith, and 0.97 for Wang. Some runners that do both within a year run Vermont faster than Rocky Racoon. On the other hand, the course record ratio is 12:44:33/14:08:40 = 0.90, much better agreement with Naismith. Oh, and the Bryce 100 – with 18,800’ of climbing, the Raccon/Bryce ratio is 0.81; a bit easier than Run Rabbit Run. Comparative difficulty ratios are a good fit in your armchair kit: for planning for new races or new training routes, or figuring out how long your training runs will take as you build up your climbing, or for comparing performances. And we started out showing how Naismith fits in your race day kit – with an elevation profile in hand, just add the equivalent of about 1 extra mile for each 500’ climbing, divide by your flat ultra pace, and estimate how long till the next aid station. But it’s not all about you – don’t forget your crew. Perhaps the real advantage of Naismith’s rule is in the field, in the middle of an ultra, for predicting the next crew meetup – which could be the next day. For races like the UTMB, crews are stuck on the race busses going around or through Mont Blanc. Runners go over mountain passes that overshadow the distance. Add in the crowds, and aid stations meetups becomes a challenge. Last year, UTMB had a free Twitter feed that reported runner’s passages through aid stations. The Twitter feed often gave both in and out times for aid stations. With Twitter, another (less crumpled) copy of the elevation profile, and Naismith’s rule, your crew can know when you’re there before you do; almost. Here’s an example. Back to Arnuva, Italy; I bid ciao with my crew at 3:30 pm on Saturday, planning to meet in the wee hours at Trient, Switzerland. No doubt this plan would confer good karma on my crew person; but in this life, sleep is wanted more, and Naismith can help with that, by predicting our meetup time in Trient. It’s 27.6 miles with 7,716 feet of climbing from Arunuva to Trient, equivalent to 42.2 flat miles. Assuming my same 4mph equivalent flat pace, that should take about 10.5 hours, plus at least an hour in aid stations – 11.5 hours, so 3:00 am Sunday ETA. But the slows set in during the wee hours, and I spent about 2 hours in the aid stations, and arrived in Trient at 4:20 am Sunday. An extra half hour between the La Fouly and Champex-Lac aid stations was reported by Twitter, but the time spent duct taping my blisters at La Giète was not. So the best Twitter and Naismith could predict was off by an hour – an hour less sleep, but that much more good karma for my crew person. Not bad, considering it was the 2nd night of an ultra, prime time for both hallucinations and real problems. And with that, you now know the geek god predictive powers of Naismith: 1. Are we there yet? 2. How long will this course/route take? and 3. See you then/there. But the true power of knowledge comes with knowing limitations. Here are a few limitation of Naismith’s rule. First, Naismith doesn’t say anything about downhill. One interpretation is that Naismith’s rule is meant for routes with equal climbing and descent – like loops and out-and-backs. And aid stations or crew points are often in valleys, so equal climbing and descending between them is a good approximation. But for routes with very different climbing and descent (like Western States), some amount of fudging is needed to make good predictions. Second, for comparing courses or routes or performances, it’s best to compare like distances – 100 milers to 100 milers, and not 100 milers to 50 milers. Everyone runs slower on longer courses. For example, on the roads, up to a marathon, pace slows about 5% each time distance doubles. More complicated rules than Naismith’s can account for this slowing, giving performance comparisons over different distances. In “Route choice in mountain navigation, Naismith’s rule, and the equivalence of distance and climb.” Journal of Sports Sciences, 25, 719–726, Scarf uses a more complicated rule to accurately model the winning times of fell races. If you assume nearly equal distances, and average his separate men and women’s rules, you get back our simple 1:10 Naismith ratio for combining distance and climbing. For our MUT Naismith rule, simplicity is a choice, to get a good fit in the ultra kit. There are so many variables in an ultra – weather, night/day, nutrition, and blisters, to name a few. The strength of Naismith’s rule is its simplicity and adaptability. By tracking your current “equivalent flat pace”, Naismith reduces the big three variables – pace, distance, and climbing – to a single variable: time. And for performance, chasing cutoffs, or crew meetups, time is what everyone wants to know.